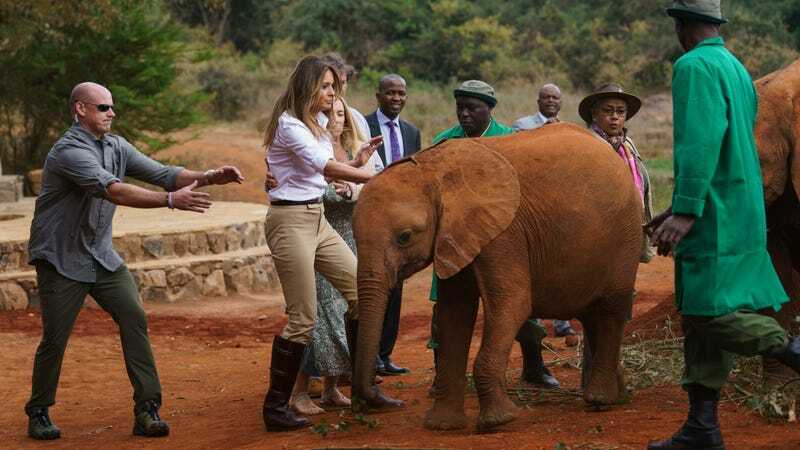 First Lady Melania Trump is currently on her four-country tour of Africa, and Friday, at the David Sheldrick Wildlife Trust elephant orphanage in Nairobi, Kenya, one baby elephant was not pleased about being used as a prop for a photo op. What is she thinking? Is this sweet elephant somehow the physical manifestation of my muted rage? What’s going on with Melania’s belt, which appears to stay firmly encircled around her waist despite the seeming lack of belt loops on her pants?